Yayoi Kusama with her work “Love Is Calling” in 2013 at a solo exhibition in New York. The Infinity Room will be on display at the ICA in the fall. The Institute of Contemporary Art has acquired one of Yayoi Kusama’s coveted Infinity Rooms — and with it, if very recent history is any indication, the collective aspirations of tens of thousands of local Instagram accounts. Indeed, for many, “Yayoi Kusama” and “Infinity Room” are virtually interchangeable terms: The 89-year old Japanese artist has achieved very-late-career popular fame in recent years, largely among a selfie-obsessed generation for whom her dazzling, mirror-lined installations brimming with otherworldly color and light have become must-haves on their social-media checklists. This is both great — I’m all for anything that brings totally original, compelling work, which the installations absolutely are, to the largest possible audience — and an awful shame, and how the ICA navigates its presentation of “Love Is Calling,” made in 2013, will be the measure of its success. The acquisition, made possible by multiple donors, will join the museum’s Barbara Lee Collection of Art by Women . 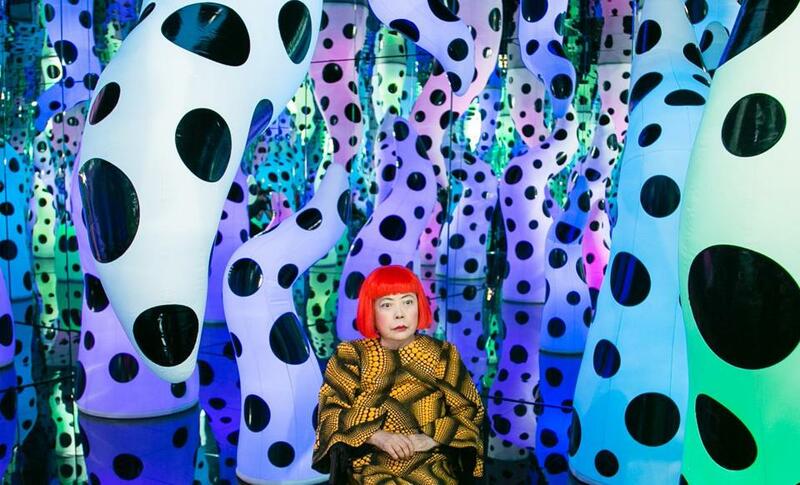 Indeed, Kusama’s rocket to superstardom has very much been a late-phase phenomenon, with museums competing to acquire an Infinity Room as Kusama’s career winds down to its final chapter (the Art Gallery of Ontario in Toronto even turned to crowd-funding). Despite Kusama having worked alongside — and in some cases, preceding — some of the most significant shifts in visual arts in the 20th century, it’s really been the Infinity Rooms — containing sculptural objects like glowing pumpkins or tentacles or galaxies of twinkling light that appear to repeat in every direction, infinitely — that have made her name in the popular consciousness. As wildly popular as the exhibition was — at each stop, hours-long waits were the norm — I found it lacking. Never mind the lines (at the Art Gallery of Ontario, where I saw it, entertainers were hired to keep weary crowds amused); it was the short shrift given to the full span of Kusama’s career that chafed with me. While it was certainly present — a room full of her recent paintings, photographs of her anti-war performances in the 1960s (mostly naked), her “Infinity Net” paintings from the early 1960s, which presaged Minimalism and caught the attention of Donald Judd — it seemed cast as a sideline to the main event, some obligatory book-learning tacked onto the blithe funhouse spectacle happening nearby. It felt uncomfortably reductive for an artist whose work is as deep, personal, and troubled as Kusama’s surely is. Lost in the spectacle was the artist’s dark history of psychological abuse at the hands of her mother, who would often send her spying on her father as he indulged in near-constant extramarital affairs. It drove her at a young age to create her own worlds, and the “Infinity Rooms” are very much the apex of that: Windows into a transcendent realm where her isolation and pain could be obliterated by a connection with the endless. If it sounds like a lot to absorb in a 20-second viewing, you’d be right. Kusama, who has lived for the past 40 years in a psychiatric institution in Japan being treated for debilitating anxiety, has never been sunny, or glib. Indeed, much of her work has been driven by a deep coping impulse: Compulsive, repetitive production, manifest most overtly in her obsession with polka dots, as a means of keeping dark reality at bay. There’s a duality to her work, in which she erases herself — “obliteration,” as she calls it, an appropriately violent term for a lifetime of suffering — as a means of seeking cosmic connection with others, beyond the physical world. “Love Is Calling,” the ICA’s new work, brims with mournful, otherworldly yearning, polka-dotted forms reaching out toward one another, never to touch, forever. But then, the crowds? The ICA is already bracing for them, studying how they might best manage them when the piece goes on view in the fall. Until then, Medvedow’s less concerned than she is buoyant. “An iconic artist whose work connects to large audiences so much that they’ll line up to see her? Bring me more problems like that,” she said, laughing.